At the replication fork the leading and lagging strands are synthesized simultaneously. This has the important benefit of limiting the amount of ssDNA present in the cell during DNA replication. When a ssDNA region of DNA is broken, there is a complete break in the chromosome that is much more difficult to repair than an ssDNA break in a dsDNA region. Moreover, repair of this type of lesion frequently leads to mutation of the DNA fsee Chapter 9). Thus, limiting the time the DNA is in this state is crucial. 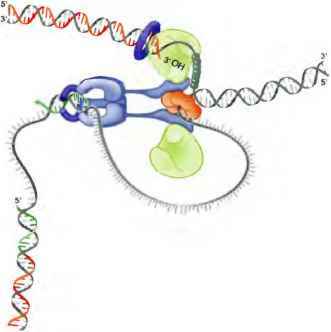 To coordinate the replication of both DNA strands, multiple DNA polymerases function at the replication fork. In E. coii the coordinate action of these polymerases is facilitated by physically linking them together in a large multiprotein complex called the DNA Pol til holoenzyme (Figure 8-20). Holoenzyme is a general name for a multiprotein complex in which a core enzyme activity is associated with additional components that enhance function* The DNA Pol III holoenzyme includes two copies of the "core" DNA Pol 111 enzyme and one copy of the five protein 7-complex (the E. coii sliding clamp loader). Although present in only one copy, the -y-cornplex binds to both copies of the core DNA Pol 111 and is essential to the formation of the holoenzyme (see Figure 8-20). How is ATP binding and hydrolysis coupled to sliding clamp loading? When bound to AIP, the clamp loader can bind and open the sliding damp ring by causing one of the subunit: subunit interfaces to come apart (Box 8-2 Figure 1). The now open sliding clamp is brought to the DMA through a high-affinity DNA-bindmg site on the clamp loader. Consistent with the need for sliding clamps at the sites of DNA synthesis, this DNA-bmd-ing site specifically recognizes primertemplate junctions, but only when the clamp loader is bound to ATP. As the clamp loader binds the primertemplate junction, the open sliding clamp is placed around the DMA, The final steps in sliding clamp loading are stimulated by ATP hydrolysis. Binding of the damp loader to the primer template junction activates ATP hydrolysis (by the clamp loader). Because the clamp loader can only bind the sliding clamp and DNA when it is bound to ATP (but not ADP), hydrolysis causes the clamp loader to release the sliding clamp and disassociate from the DMA Once released from the clamp loader, the sliding damp spontaneously closes around the DMA. The net result of this process is the loading of the sliding clamp at the site of DMA polymerase actions—the primertemplate junction Release of ADP and P and binding to a new ATP molecule allows the damp loader to initiate a new cycle of loading. 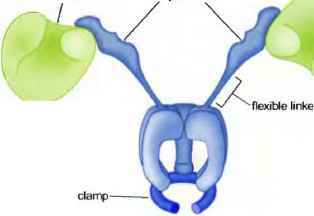 The function of the clamp loader illustrates several general features of the coupling of ATP binding and hydrolysis to a molecular event ATP binding to a protein typically is involved iri the assembly stage of the event: the association of factor with the target molecule. For example, the clamp loader has two target molecules: the sliding damp and the pnmentemptale junction. 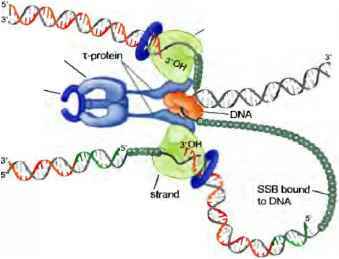 ATP is required tor the clamp loader to bind to either target Similarly, ATP binding stimulates the ability of DNA bel¡cases eo bind to ssDKA In each case, the events coupled to ATP binding coutd be considered the action part of the cycle. For the clamp loader, ATP binding but not ATP hydrolysis ts required to open the sliding damp ring, for the DNA belicase, binding ssDNA is likely to be the key event unwinding DNA In these cases, binding to ATP stabilizes a conformation of the enzyme that favors interaction with the subst/ate in a particular conformation. What is the noie of ATP hydrolysis? ATP hydrolysis typically is involved in the disassembly stage of the event, releasing the bound targets from the enzyme. Once the ATP-stabilized complex is formed, it must be disassembled, this could occur by simple disassooation; however, more often than not this process would return the components to their starting situation (for example, the sliding damp free in solution), and this process would be slow if the ATP-stabilized complex is tightly associated. To ensure that disassembly occurs at the appropriate time, place, and rate, ATP hydrolysis is used to initiate disassembly. For example, ATP hydrolysis causes the damp loader to revert back to a state in which it cannot bind either the sliding clamp or DMA. Reversion to this ground state may occur while the enzyme is still bound to the products of ATP hydrolysis (ADP and P,) of may require their release. The finai key mechanism to couple ATP hydrolysis to a reaction pertains to the trigger for AIP hydrolysis It is critical that the factor not hydrolyze ATP until a desired complex is assembled. Typically, formation of a particular complex triggers ATP hydrolysis. In the case of the damp loader, this complex is (he tertiary complex of the sliding damp, the clamp loader, and the pnmertem-pfate junction. Thus, ATP control of these molecular events is most directly related to controlling the timing of conformational changes by the enzyme 6y requiring the enzyme to alternate between two conformational states in order and requiring the formation of a key intermediate to trigger ATP hydrolysis, the enzyme can accomplish work fn contrast, tf the enzyme merely bound and released ATP (without hydrolysis), the reaction would return to the initial state as often as it would proceed forward and little, if any, work would be accomplished. Hew do two DNA polymerases remain linked at the replication fork while synthesizing DNA on both the leading and lagging template strands? A model that explains this proposes that the replication machinery exploits the flexibility of DNA (Figure 8-21). As the heli-case unwinds the DNA at the replication fork, the leading slrattd is rapidly copied while ihe lagging strand is spooled out as ssDNA that is rapidly bound by SSIk Intermittently, a new RNA primer is synthesized on the lagging strand template. When the lagging strand DNA polymerase completes the previous Okazaki fragment, this polymerase is released from the template. Because this polymerase remains tethered lo the leading strand DNA polymerase, it will bind to the primentemplate junction nearest the replication fork—-the one formed by the newly synthesized RNA primer on the lagging strand. 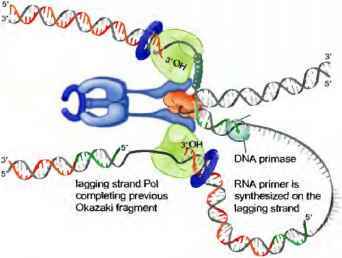 By binding to this RNA primer, the lagging strand polymerase forms a new loop and initiates the next round of Okazaki fragment synthesis. This model is called the "trombone model" in reference to the changing size of the DNA loop formed by the lagging strand template. DNA replication in eukaryotic: cells also requires multiple DNA polymerases. Three different DNA polymerases are present at each replication fork: DNA Pol u/primase. DNA Pol &, and DNA Pol e (see Figure 8-16). DNA Pol a/prirnasr initiates new strands and DNA Pol 5 and e extend these strands. Although there is evidence that DNA Pol 5 and e synthesize opposite DNA strands, it remains unclear which polymerase is responsible for leading and which is responsible for lagging strand synthesis. Similarly, tlie proteins that recruit, maintain, and coordinate the action of these three polymerases at the eukaryotic DNA replication fork remain Unknown (the eukaryotic sliding clamp loader. RF-C, does not perform this functinn). FIGURE 8*21 The "trombone" model for coordinating replication by two DNA polymerases at the E. co/i replication fork. (b) Periodically, DNA primase wi!l associate with the DNA helicase and synthesize a new primer on the tagging strand template, (c) When the fagging strand DNA polymerase completes en Olcazaki fragment, it is released from the sfiding damp and the DMA. The connections between the components of the DNA Pol III holoenzyme are not the only interactions that occur between the components of the bacterial replication fork. Several protein-protein interactions, heynnd those between the components of the Pol 111 holoenzyme, facilitate rapid replication fork progression. 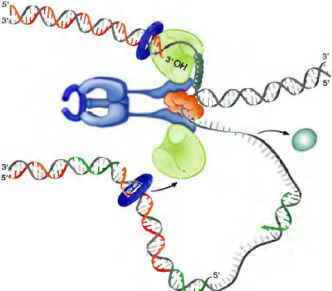 The most important of these is an interaction between the DNA helicase [the hexameric dna!3 protein; see TnbJe 8-1) and the DNA Pol III holoenzyme (Figure 8-22). This interaction, which is mediated by the clamp loader component of the holoenzyme, holds the helirase and the DNA Pol III holoenzyme together. In addition, this association stimulates the activity of the helicase by increasing the rale of helicase movement tenfold. 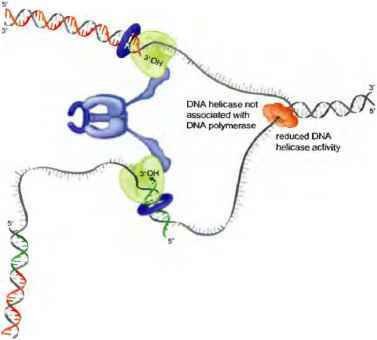 Thus, the DNA helicase slows down if it becomes separated torn the DNA polymerase (see Figure 8-22). The coupling of helicase activity to the presence of DNA Pol 111 prevents the helicase from "running away" from the DNA Pol III holoenzyme and thus serves to coordinate these I wo key replication fork enzymes. FIGURE 8-22 Binding of the DNA helicase to DNA Pol 111 holoenzyme stimulates the rate of DNA strand separation. The t-subumt of the clamp loader interacts with both the DNA helicase and the DMA polymerase at the replication fork, (a) When this interaction is made, the DMA helicase unwinds the DMA at approximately the same rate as the- DMA polymerases replicate the DNA (b) If the DMA helicase is not associated wtth DMA Pol 111 holoenzyme, DMA unwinding slows by tenfold. Under these conditions, the DNA polymerases can replicate faster than the DMA helicase can separate the strands ot unrepealed DMA. This allows the DMA Pol III holoenzyme to "catch up" to the DNA helicase and the reformation ot a full reptisome associates with the helicase and SSB-cuated ssDNA and synthesizes a new RNA primer. Although the interaction between the DNA helicase and primase is relatively weak, this interaction strongly stimulates primase function (approximately 1,000-fold). After an RNA primer is synthesized, the primase is released from the UNA helicase into solution. The relatively weak interaction between the ft", coh primase and DNA helicase is important for regulating the length of Okazaki fragments. A tighter association would result in more frequent primer synthesis on the lagging strand and, therefore, shorter Okazaki fragments. Similarly, a weaker interaction would result in longer Okazaki fragments. The combination of all the proteins that function at the replication fork is referred to as the replisome. 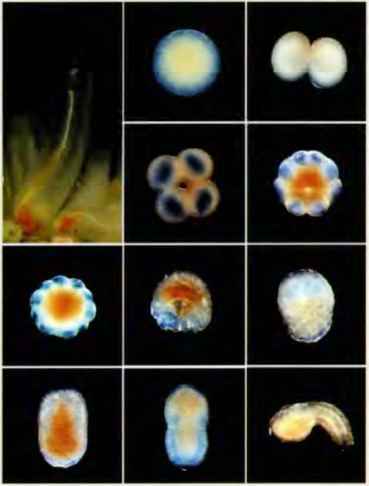 Together these proteins form a finely tuned factory for DNA synthesis that contains multiple interacting machines. Individually these machines perform important specific functions. When brought together their activities are coordinated by the interactions between them. Although these interactions are particularly well understood in E. coli cells, studies of bacteriophage and eukaryotic DNA replication machinery show that a similar coordination between multiple machines is involved in DNA replication in these organisms. Indeed, there are clear parallels between the proteins known to be involved in replication in E. coli and those functioning in these other organisms. A table of the names of factors performing analogous functions in phage, prokaryotic, and eukaryotic DNA replication is shown in Table 8-1. To fully appreciate the amazing capabilities of the enzymes that replicate UNA, imagine a situation in which a DNA base is the size of your textbook. Under these conditions double-stranded DNA would be approximately one meter in diameter and the E. coli genome would be a large circle about 500 miles (BOO km) in circumference. More importantly, the replisome would be the size of a FedEx delivery truck and would be moving at over 600 km/hr (375 rnph)! Replicating the E. coli genome would be a 40 minute, 250 mile (400 km] trip for two such machines, each leaving two 1 meter DNA cables in their wake. Impressively, during this trip the replication machinery would, on average, make only a single error. Why interaction between the primase and helicase is relatively weak? What is the function of primase? 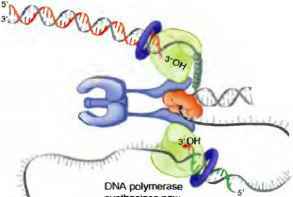 Why dna polymerase is reffered to as holoenzyme?